When Nina and I looked up information on how to get from Thailand to Malaysia and then onto the Indonesian islands, resources were limited. The most common answer to our question was “get a cheap flight”. So I write this blog not just about our adventures, but the logistics too, hopefully serving as a resource for others. We found this stretch of landscape fascinating, with great places to stop along the way, so if you have time – forget the plane! Our budget check in Phuket revealed that if Nina and I were to stay in Thailand any longer it had to be money free. We also felt undernourished in the permaculture hands-on department. That evening we spent hours scouring the internet for potential projects to join. We also wanted to continue south, this eliminated the many opportunities in northern Thailand. 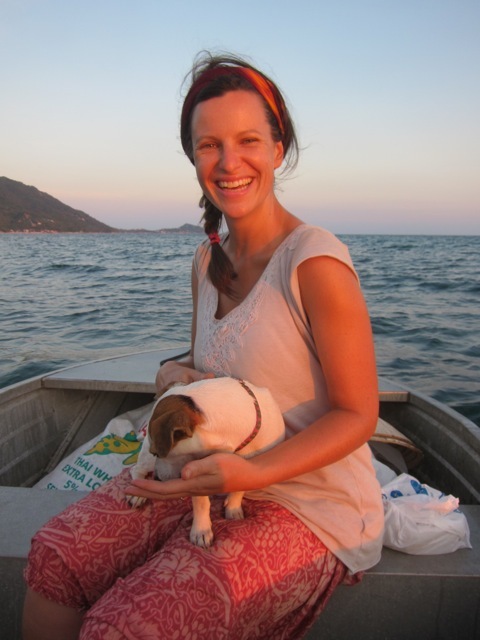 After limited responses from the WWOOF or Permaculture Global networks we looked up HelpX – £18 for a two year joint membership. It opened up more options to work on the land plus other opportunities ranging from eco-tourism to home help and teaching. HelpX is where we found Guillaume. 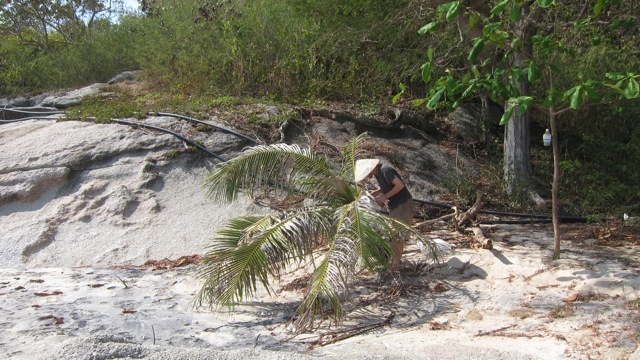 A young French not-quite-retired lawyer establishing an “eco-lodge” in a beautiful setting, next to the beach on the party island of Koh Phangan. We decided weeks earlier that we’d avoid this island, famous once for underground hippie trance parties, now more known for 20 thousand teens dancing to Lady GaGa with dayglow “full moon” t-shirts! 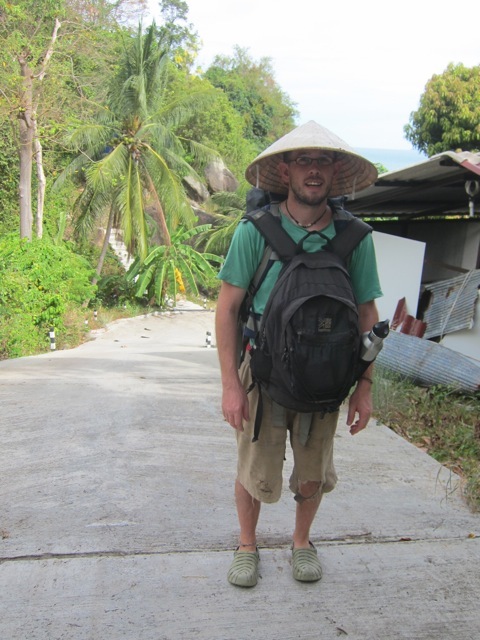 However, Guillaume described his property as remote (367 stairs down from the road) with a project to establish permaculture ideas and appropriate energy technology. The other main drawcard for us was the chance to learn about and help with the efforts on biological pest management systems. In much of South East Asia the coconut palms are being attacked by the Brontispa beetle. They lay their larvae in the young shoots of coconut palms. Trees become weak and die very quickly. The beetle was introduced accidentally on imported ornamental palms from Indonesia where it has a natural predator. In affected areas breeding and release of the predating parasitoid seems to be working well with no adverse and actually very positive effects. We were concerned about the introduction of an alien species and suspected there might be some affect on the native flora and fauna but were assured that the results are positive and this technique means there is no use of chemical pesticides. 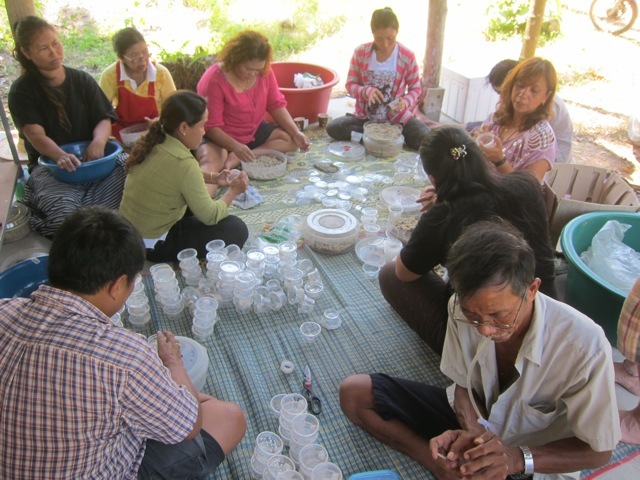 We spent time understanding the breeding procedure, visiting another operation in a nearby village and assembling the materials needed to breed. Unfortunately due to the time taken for larvae to hatch there was no chance to complete a full cycle of the program before our 3 weeks on the island were up. We did however gain valuable experience in the procedure. Our attention to the beetle project also took a back seat as Guillaume’s water needs understandably became as important to him as anything else. The last of the rainy season downpours finished early this year and his spring began to reflect that. We gave advice on effective techniques to hold water in the landscape – use all catchment, store water high in the property, spread it over the longest distance, affecting the most life as passively as possible. We spoke about earth moving techniques to capture and hold large bodies of water and potentially rehumidify his property. Guillaume also has large roofs with no tanks and a lot of leaky pipes. Unfortunately, some peoples’ idea of eco-tourism promotes aesthetics as more important than careful design, sustainability or the order of permanence. Guillaume was not particularly open to our design ideas which represent designing for water security as top of the list. He had his own ideas, and although we can offer advice, others must walk the path for themselves before the realisation of what can be achieved using PC design. Another great lesson – I have to be the change, not preach the change. My attention turns once again to Australia. Nina and I talk more that evening about our aspirations there. Whilst I understand that there are many incredible projects using real permaculture design across the globe, I am coming to realise that they are few and far between. The knowledge still has a long way to travel. I wish in the last months we had dug out more of them but our journey has become rather one directional of late, more of a mission to get home above time to explore. I have seen many examples of projects using the word “permaculture” like we see the word “eco” banded around for credibility. “We have a permaculture garden” used in place of “we grow food” or “we grow organic veg”. I’m happy that the term is becoming heard, as it leads people to ask more questions. It’s only by asking more questions that we find more answers. It’s then that we realise that permaculture is a design system, a set of ethics and principles that integrate not just our vegetable garden but the choices we make in life too. In future I will do more research on the projects I choose to volunteer. Aside from my disillusionment of peoples’ understanding of permaculture, we had a fantastic time with Guillaume, full of great conversation, enjoyable evening meals on the shoreside deck. Garden and Rice paddy creation. 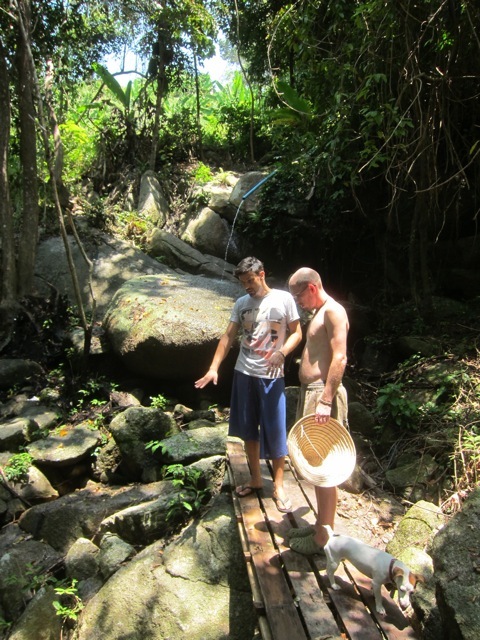 Exploration of the island’s jungle and a chance to meet other expats trying new ventures in a land far from home. Oh yes, and the little boat trip at sea! 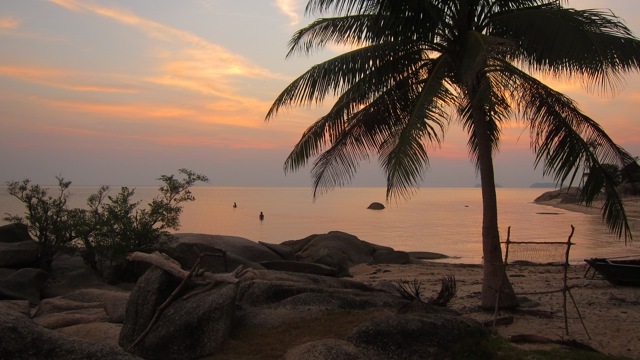 We spent many days deliberating in Koh Phangan about our on ward route to Australia. I wrote to at least 30 shipping companies asking for passage with them from Singapore. We contacted yachts in Malaysia through HelpX. We contacted people through Couchsurfing who work for shipping agents in Singapore. We even asked about cancellations for cruise ships (just through curiosity). 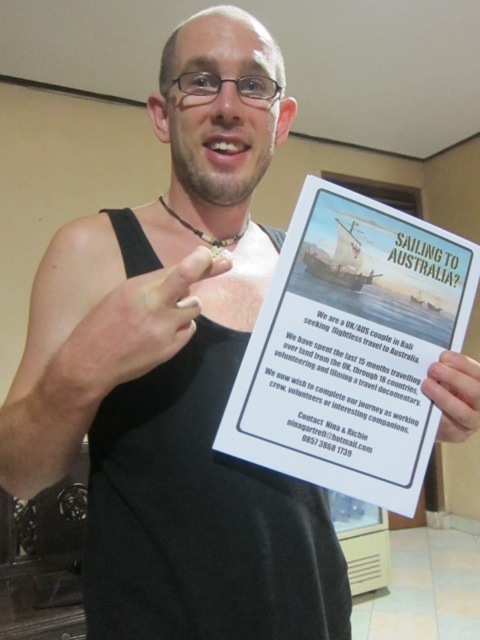 We applied for positions on ships and cargo vessels, wrote to Marinas and generally exhausted all options before deciding that our best chance of reaching Australia by boat was to get to the furthest place that we can, using public transport, and try from there. Many other people’s last port of call too – Bali. 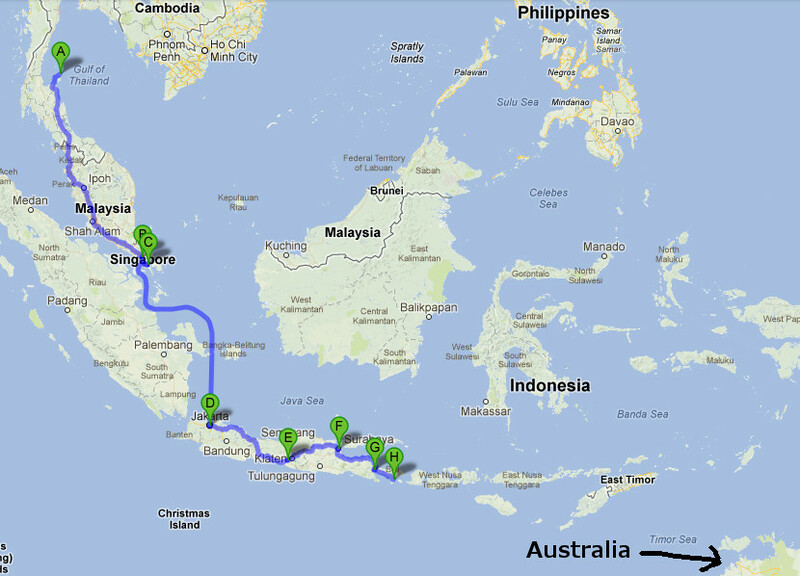 From Bali there will surely be people crossing that little stretch of water to Darwin! Getting off Koh Phangan island and onto a train to Malaysia was easy and should be from anywhere in Thailand. It’s cheaper to purchase your ticket in advance at a government ticket booking office yourself. We left from Surat Thani which is a popular travel junction heading south. There is no railway booking office on Koh Phangan and so an agent was necessary, and maybe easier, as the ticket includes transport to the ferry, the ferry ticket itself, and a local bus connection to the train station, plus your train ticket. Total cost of ticket – 1450TB (£33) to Butterworth, the jumping off point to Penang’s Georgetown, in Malaysia. This is the furtherest point south that a ticket can be booked from Thailand. We were on the 1.26am train and bedded down upon boarding. We reached the Malaysian border control by 6am. They stamped us in with a free 3 month tourist visa and after a little delay changing the chugger, we reached Butterworth by midday. 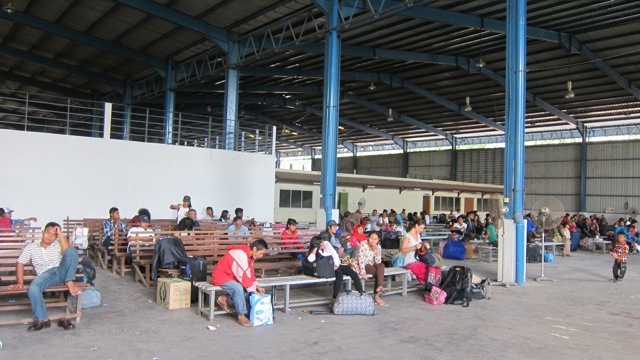 The station was a short walk to the ferry terminal that takes you on a 30 minute crossing to Penang island (about 10p). We stayed in Georgtown for a couple of nights, mostly to try it’s famous food. Indian cuisine meets Chinese in a magic blend of spiced curries, sweets, funky deserts and rotis! We explored the manageable, likeable city on foot, picking up a bargain pair of new shorts at a carboot sale, and taking a few photos around the old colonial part of town. Travel down to Kuala Lumpur was also super easy, taking the ferry back over the water (this time free) straight to the bus terminal. Ignore anyone who approaches you for a ticket and find the bus you need. Once you have, ask someone on the bus the cost before giving your money to a conductor onboard on the driver. This saves you paying extra for the ticket which should be 32MYR (£6.50) The buses run every 20 minutes or so and take 4 or 5 hours with wide seats and a good recline. I think both Nina and I got a bit of shut-eye. Nina had lined us up a coachsurf in KL with a very interesting and generous family. We were welcomed with open arms by Reeza, Shukreen and Kanoa. We chatted for a while up on the 19th floor of their tower block before they whisked us out and treated us to some traditional Malay food. We truly wished we had more time in KL to spend with those guys as we shared so much in common and were so fascinated by their interests in media, conservation and faith. The next day a big day out on foot was all we needed to explore the major sites of the city. Cities seem to wear us down quite quickly at this stage on our trip, but the food was out of this world and the botanical gardens seemed a world away but only a small walk from the centre of town. We boarded the night train from KL at 23.00 to travel to Johor Bahru, having purchased our tickets the previous day at the central station – 39MYR (£8.40). Johor is on the southern Malay peninsular and if you depart for Indo from here it saves entering Singapore. 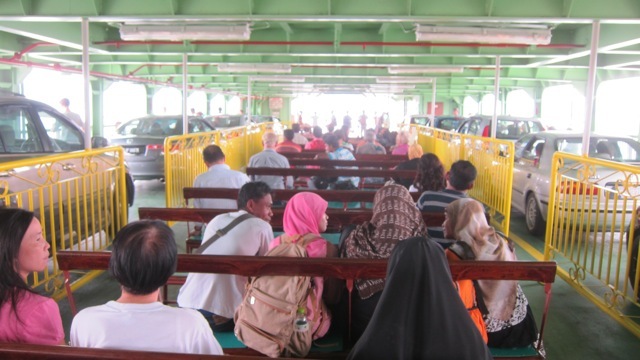 We also found out that the the ferry over to Batam island was cheapest from here. On arriving at Johor in the morning you can take the number 123 bus from right outside. Tell the driver you need the ZON ferry terminal and jump off there. 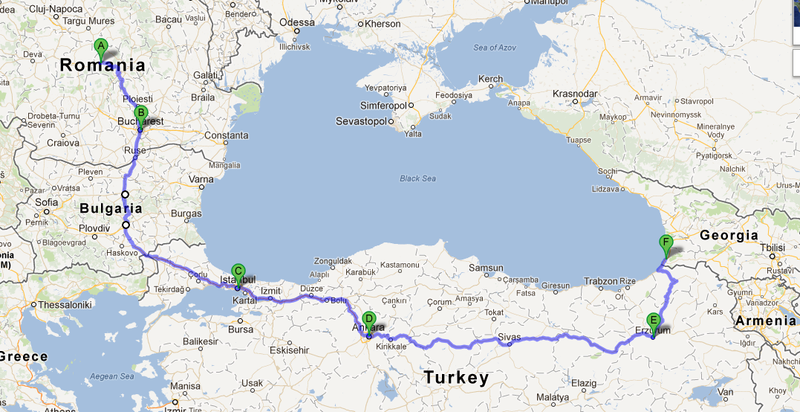 No need to buy any ferry tickets in advance for this leg of the journey as some websites suggest. Ask anyone where the ticket office is and buy your 69MYR (£15) ticket for the next departing ferry to Batam Center. Bare in mind that although this 90 minute journey seems like another island off the coast of Malaysia you are actually entering Indonesia. We did consider buying a return ferry ticket as some countries ask for proof that you are leaving before issuing you a tourist visa. In this instance we risked it to save money. Nobody cared less and as long as you have your $25 to hand they wave you in with a friendly smile and a 30 day stamp. Now in Indonesia and presuming you’re heading straight over to Java you will need to get to the infamous Pelni ferry ticket office. Ignore the taxi drivers and walk straight out of the ferry terminal. Ask for the local bus to Sekupang, price 3,000IDR (20p). This takes you over to the other side of the island. Jump out and ask anyone where the Pelni ticket office is. It’s not at the huge metal shed from where the ship departs. Instead it’s hidden up a hill at the end of the road. We opted for the “Economik” tickets which were 269,000IDR (£18) and purchasing them was simple. No need to worry about this in advance as the ship holds 3,000 people (and probably 3million cockroaches) as there is always room for one more! We waited in the “holding pen” for a few hours as it was not clear when the ship would leave. It was clear, however, that although there are some “first class” cabins available, this was a journey for the working class of Indonesia. Mostly families, some looked like they were moving house even. When the flood gates finally opened there was a stampede towards the boat as guys ran past with 40inch TV’s stapped to their heads and Mum’s dragging kids, packed lunches tucked under their arm. We arrived on 4th deck with the other sardines and packed ourselves in for the ride. 36 hours, sleepless, dirty, alive with infestations, screaming TV’s, continual chain smoking, 24/7 fleuro lights and mostly unbearable humidity. 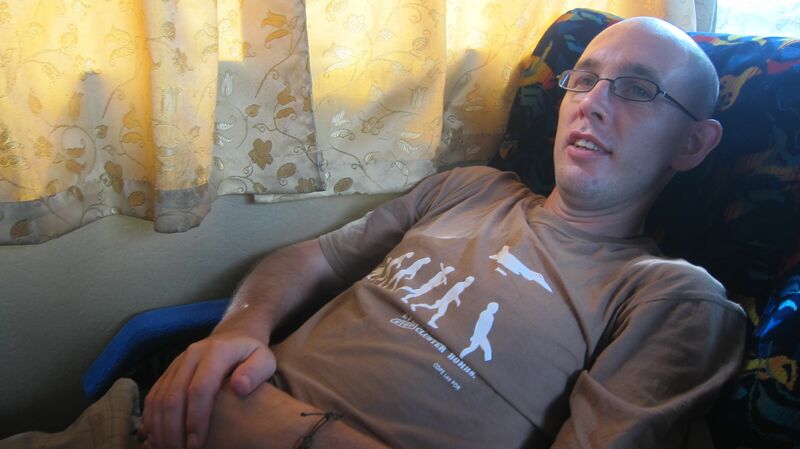 This trip is not for the faint hearted. We made some nice friends though and enjoyed some time in the crew area sharing family photo’s. We later heard that for double the cost you can take a private cabin. No seats were available when we arrived at Senan station and given how wrung out we were it was probably a good thing. We sat with a very patient young fella, with great English, to figure out our next move. Everything pointed towards a guest house for the night, a little exploration of Jakarta and a train leaving tomorrow at a reasonable time. That’s exactly what we did and booked our tickets with the helpful chap for the 13.00 to Yogyakarta the next day – 90,000IDR (£6). We’d been told “Yogya” was a great place to break the journey east with the impressive Borobudur temple complex and surrounding volcanoes. 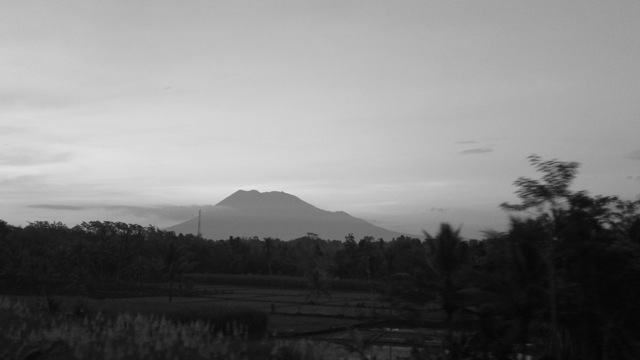 The train ride through the Java countryside was spectacular. 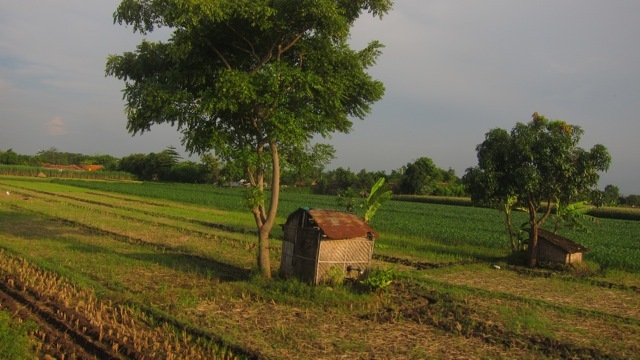 Rice fields tumbled down the hillsides, backdropped by Volcano peaks and jungle. I thought we would see more palm plantations as described in the shocking documentary GREEN but I was pleased to see people out on the land using no mechanised techniques. 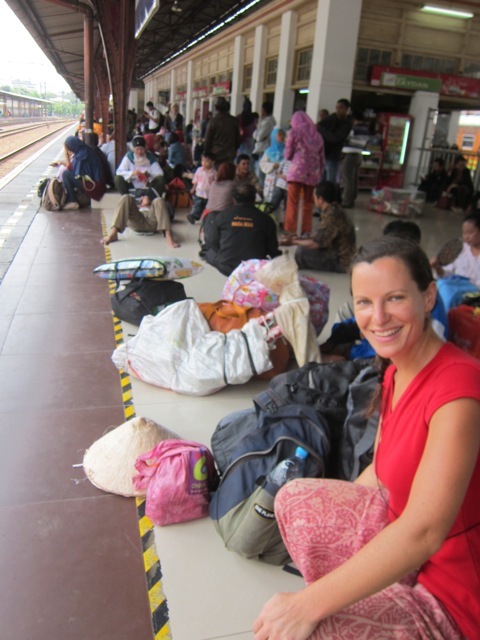 The onward train journey from Yogya also meandered east through mostly rural landscape, arriving late in the evening in Banyuwangi, once again booked independently at the train station – 34,000IDR (£2.50) – making a 13 hour train journey very reasonably priced. It was late when we arrived in Banyuwangi and we took a room before a simple ferry crossing the next day onto Bali island to complete the 3790km journey. Ferry ticket 6,000IDR (40p). Do you need crew to Oz? We’d crossed the border into the north west of China after a 22 hour overnight sleeper bus which was quite pleasant. However all we wanted now was a train ride, you get a bit more space and it’s generally a more comfortable ride than the buses. I stared up at the display board in the main train station. It didn’t take much deciphering to realise there were no seats or beds on any train heading south. It was a muslim holiday and everything was booked for 5 days ahead. Another sleeper bus seemed the only other option for the 2900km journey south. We scouted around for a bus and after trying a couple of different stations in opposite sides of the city we were finally sold a ticket for a sleeper bus and told the journey would take 26 hours. We went for some food, pumped water through our filter and boarded the bus a few hours later. There were no beds on the bus and there was no way to take back our tickets. We wanted to head south and this was our only option. A translation from another passenger hinted at 38 hours and after sitting for 2 hours in the station we hit the road, bitter that we’d been lied to, bouncing in our unfixed seats above the back axle of a very ropey looking bus! The most arduous, weirdest, smokiest, longest and coldest journey of our overland trip was underway. Within a few hours we were driving across the desert in a sand storm. Everyone looked a little scared as the bus was thrown around, creeping forward when visibility allowed. We soon had to pull over and for some reason once the passengers got out the driver locked the door leaving us all to avoid the sheets of metal being blown around outside, covering our faces and huddling together. We still don’t know why he wouldn’t let us back on the bus??? We started counting the hours between broken sleep. It was Sam’s birthday and we spent the whole day and night in a traffic jam watching the local’s eat chickens feet whilst we went hungary, hoping we would soon get going again and stop somewhere for food. The spitting continued all around us, a quick go on the ipod every few hours helped to forget where we were. If only there was something interesting to look at out of the window, but it was bleak. On day three we started to enter into landscape with people and houses and later that day we were driving through Sichuan with high pastures, tibetan cowboys on horseback, yaks and traditional houses. We were delirious by now and kind of settled into the journey. 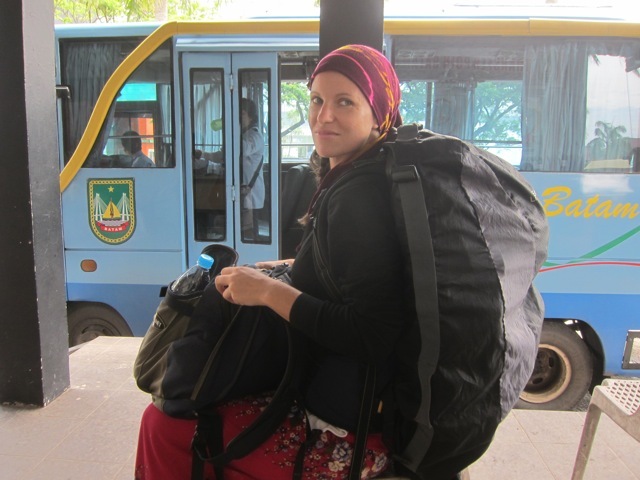 We arrived in Chengdu on the forth day morning, 83 hours after boarding the bus in Urumqi. It was hard to feel anything but delirious. Sleep was slim pickings since the first night but we’d made it and we can probably thank the other passengers for their contentment. It must have rubbed off on us.